U.N. Is Sued Over Haiti's Cholera Epidemic, Which Turns Out To Be Far Worse Than Previously Thought : Goats and Soda The demands: a U.N. apology for bringing the disease to the island, reparations for victims, repairs to the water system. Meanwhile, a study shows the toll is far worse than previously thought. Health workers collect the body of a cholera victim in Petionville, Haiti, in February 2011. The disease first appeared on the island in October 2010, likely introduced by U.N. peacekeepers from Nepal, possibly a single individual. Desir and his mother are among at least 770,000 Haitians struck down by cholera since late 2010 — almost 8 percent of the population. More than 9,200 have died. It's the largest and most explosive cholera epidemic in modern times. Since cholera is now endemic in Haiti, the epidemic continues. 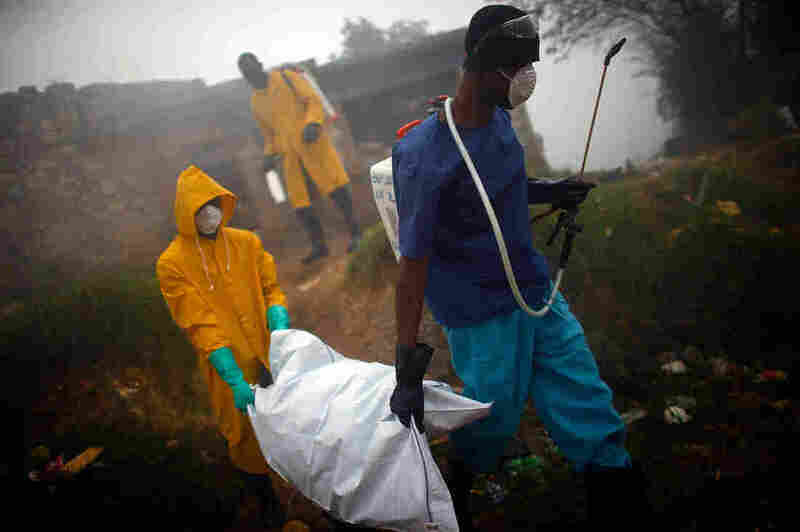 So far this year the disease has struck more than 7,800 people and killed nearly 100. And there's new evidence that the toll from Haiti's ongoing cholera epidemic is significantly higher than official tallies suggest. Meanwhile, survivors appear to be making headway in a legal and public relations campaign to gain compensation from the agency they blame for introducing cholera to the island nation: the United Nations. A study, which appears this month in Emerging Infectious Diseases, indicates Haiti's official count of cholera cases and deaths are a big understatement. A house-to-house survey in four communities — two urban and two rural — has uncovered nearly three times more cholera deaths in the first six months of the epidemic than officially recorded. In some hard-to-reach villages, researchers found, cholera killed 1 in every 20 residents in the early months of the outbreak. "It is likely that many other areas in the country suffered similar rates of death occurrence," says Dr. Francisco Luquero of Doctors Without Borders, an author of the study. It's widely believed that U.N. peacekeepers — possibly just a single soldier — brought cholera to Haiti during deployment from Nepal, where cholera is a perennial threat. Before Haiti's epidemic began in October 2014, the disease hadn't been known in Haiti, this hemisphere's poorest country. Poor sanitation at a U.N. camp for peacekeepers allowed cholera-contaminated sewage to enter a tributary of Haiti's largest river, the Artibonite. Within days, hundreds of people downstream, like Jean-Clair Desir and his mother, were falling ill. The disease subsequently spread to the entire country. Daniele Lantagne, a Tufts University environmental engineer, is one of four independent experts appointed by the U.N. in 2011 to investigate the outbreak. "I and the panel believe, and the scientific consensus is, that the most likely source was a peacekeeper or peacekeepers" at the U.N. encampment, Lantagne told NPR. "There is not an alternative hypothesis that is credible." She adds that DNA analysis strongly suggests "this outbreak was probably started by one or very few infected, asymptomatic individuals — I would guess one." Dr. Louise Ivers of Partners in Health, a major provider of health care in Haiti, says the new study redefines the already huge toll from Haiti's cholera epidemic. "This is a very important paper," Ivers says. "We've said all along that we thought cholera had a much bigger impact than the numbers were showing. There was no possible way all those deaths were being counted. I do think it raises the stakes in terms of what happens." Those stakes are already very high. A three-judge federal appeals court panel held a hearing March 1 on whether the U.N. should be held accountable for Haiti's devastating epidemic. A federal district judge last year dismissed the class-action suit, ruling that international treaties immunize the U.N. from lawsuits. The plaintiffs appealed the lower court's dismissal, resulting in this month's hearing. The United States is defending the U.N., since the agency is headquartered in New York. The lawsuit was brought by the Boston-based Institute for Justice and Democracy in Haiti and a sister group in Haiti on behalf of 5,000 cholera victims. They want the U.N. to end cholera by installing a national water and sanitation system; pay reparations to cholera victims and their families; and publicly apologize for bringing cholera to Haiti. The plaintiffs contend the U.N. forfeited its legal immunity when it failed to launch an internal process to adjudicate the plaintiffs' claims, as they say its own commitments require. "The U.N.'s conditional immunity does not authorize impunity," plaintiffs' attorney Beatrice Lindstrom told the three-judge appeals panel. The judges seemed to be struggling to find a way to provide some compensation to Haitian cholera victims. For instance, Judge Barrington Parker asked Assistant U.S. Attorney Ellen Blain, representing the U.N.'s position: "Would the United States government concede that if you're right and these people are completely remediless, that that is a very bad result?" Blain said the U.S. government "certainly recognizes that this is an unfortunate and tragic humanitarian catastrophe," but asserted that the U.N. has "absolutely immunity ... for a very important reason." She was alluding to U.N. officials' fear that if the Haitian plaintiffs succeed in piercing the agency's cloak of immunity, it will open the way to unlimited lawsuits seeking compensation for acts of the U.N. or the 150,000 peacekeeping forces it sends out into the world each year. But this argument is being sharply challenged by some of the U.N.'s own staff – a group of five "special rapporteurs" who are appointed to act as internal watchdogs. In a letter to U.N. Secretary General Ban Ki-moon presented on March 15 to the U.N. Human Rights Council, the rapporteurs rejected the argument that compensating Haitian cholera victims would be "opening the floodgates to claims against the United Nations." This is believed to be the first time the U.N.'s human rights watchdogs have criticized the agency itself, rather than member nations. The rapporteurs also criticized the U.N.'s efforts to control cholera through clean water and sanitation as "clearly insufficient." So far the U.N. has spent about $140 million on cholera control in Haiti — only 6 percent of the $2.2 billion the agency says will be needed to eliminate cholera there. In unusually blunt language, the rapporteurs told Ban that the U.N.'s denial of "an effective remedy" for cholera "challenges the credibility of the Organization as an entity that respects human rights." NPR asked the secretary general's office for a copy of his response to the rapporteurs' letter. A spokesman said Ban's response could not be released. But he said the secretary general told the rapporteurs that he "reaffirms the U.N.'s commitment to the fight against cholera in Haiti and the protection and promotion of human rights." In perhaps the most significant disclosure, the spokesman said Ban welcomes the rapporteurs' offer "to discuss further what additional steps might be taken to assist the victims of cholera and their communities." It's evidently the first time Ban has hinted at the possibility of such a discussion. Meanwhile, the U.N. has received thousands of letters from Haitian cholera victims detailing how the disease has affected them and their families. One letter was from Jean-Clair Desir, the student who lost his mother to cholera early in the outbreak. "President, Members of the United Nations Security Council and all other responsible, I lift my head to look at the sky so I may strongly salute you," he wrote. "I know you are promoting human rights and respect, [but] in fact ... you refused to compensate us; that is bad."